BMW is celebrating its 100th anniversary, and part of the festivities involves a series of futuristic prototypes of what the next 100 years could hold for the German automaker. The latest to be released, at an event in Los Angeles, is a motorbike that looks straight out of Tron. It's called the Mororrad Vision Next 100, and BMW says that it's so safe that you'll be able to ride it without a helmet. How? Well, it has self-balancing wheels - like the ones in a Segway - which stop it from ever falling over. Even at a complete stop, the bike will stand upright. 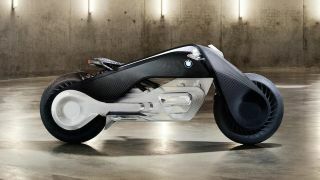 "Its self-balancing system will help protect the rider at any time," said Edgar Heinrich, the design director of BMW's motorcycle division. "Any late reaction from the driver will trigger and the vehicle will balance out." What's more, it's electrically-powered, which means zero emissions (as long as your electricity comes from a zero-emissions source), and the power unit folds up like an accordion when the bike is parked. BMW has envisioned a bionic riding suit and visor to accompany the bike, with the visor beaming augmented-reality lines and bank angles onto the road ahead, controlled by gaze-tracking.